The Union Museum in Dubai ... prestigious project. This new museum will chronicle the history of the UAE and will be located adjacent to Dubai’s Union House, where the country’s rulers signed the constitution of the UAE on December 2, 1971. ASGC will be building eight distinct sections, each corresponding to specific historical periods or themes, in addition to all supporting facilities. ASGC’s growth momentum continues as it accesses new and diversified sectors and industries that accelerate its expansion not only within the UAE, but also within select and dynamic markets across the region. “We are uniquely positioned for steady growth in the years ahead as we leverage our 25-year history, our strong client relationships, and our widely respected expertise as an integrated construction group,” he adds. Another new milestone for the company is the award of the prestigious CSR Label by the Dubai Chamber for Responsible Business. The award is bestowed on select UAE companies following an assessment which includes comprehensive audit and site visits. This rigorous selection process confirms that a potential award winner is fully committed to the principles of CSR across four key areas: community, marketplace, workforce, and environment. Azmy received the CSR Label award from Hamad Buamim, president and CEO of Dubai Chamber at the Chamber’s office. ASGC is currently working on the second phase of the Onyx project, under a contract awarded last year by Ishraqah for Development. The freehold project is located in a prime location near the Greens and Emaar Business Park on Sheikh Zayed Road, in the immediate vicinity of the Emirates Golf Club and across the road from Media City. City Walk residential complex ... an ongoing project. The scope of the project includes construction of three towers that will include a 210-room business hotel, a commercial tower and a mixed-use tower in addition to a large selection of retail facilities and restaurants integrated in the buildings’ four-storey podium. The total project built-up area is approximately two million sq ft.
ASGC, in joint venture with Kier, is also engaged in the construction of all residential buildings on Meraas’ iconic new development – Bluewaters Island. The joint venture will construct eight high-grade, mid-rise residential buildings. 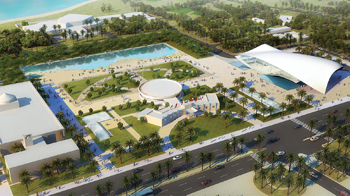 Other ongoing projects include the Adco Qusahwira Compound, City Walk residential project, Marina Bloom – Abu Dhabi, Adnoc Guest House, Nestlé Manufacturing Facility, City Walk medical centre, among others. Founded in 1989 in Dubai, ASGC provides turnkey general contracting solutions across a range of market sectors, including residential, commercial, hospitality, healthcare, industrial, leisure, infrastructure, and oil and gas. In addition to undertaking large-scale construction projects, the firm also offers a number of related construction products and services, including mechanical electrical and plumbing (MEP) services and structural steel, readymix concrete and precast products, as well as interior fit-outs through a number of subsidiaries. 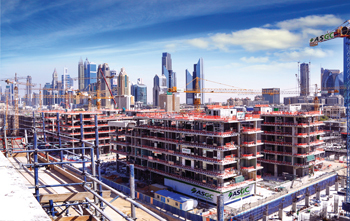 During the past 25 years, ASGC has worked on more than 250 projects and has developed a deep understanding of the local construction market with a reputation for consistently delivering high-quality projects. Its clients include Meraas Holding, Dubai Properties, Bloom Properties, Emaar Misr, wasl Asset Management, Al Habtoor Group, IFA Hotels & Resorts and Damac. Government clients include the RTA, Dubai Police, Abu Dhabi Health Authority (Seha), Dubai Aviation Engineering Projects (DAEP) and Abu Dhabi National Oil Company (Adnoc). ASGC’s landmark projects include the Waldorf Astoria Hotel and Golden Mile (Palm Jumeirah, Dubai), City Walk (Jumeirah, Dubai), Jumeirah Beach Residence Sector Six (Dubai Marina, Dubai), Business Central Towers (Sheikh Zayed Road, Dubai), Marina Bloom (Abu Dhabi Marina), Oceanscape (Reem Island, Abu Dhabi), Vision Tower and Bay Square (Business Bay, Dubai), Dubai International Airport support facilities and Dubai Police General Headquarters (Al Twar, Dubai).